Baingan is eggplant or brinjal as it is commonly called in the north of India. I find this vegetable very very versatile, especially I love the way Italians treat this mushy lovely vegetable. I have tried brinjals with mozzarella and that's a combination so weird for us Indians and yet so yummy. But I am not talking about a cheesy baingan here. It is all about a desi recipe today, which originates from Bihar or may be with some Bengali influence. I learnt it from a family of laborers who used to stay in our compound when our home was being constructed. They used to call it baingan ka tarua and the same name was adopted by my family for the love of funny and unusual names. A mustard based brinjal curry is called as Lafda in my family and I don't know why. You get the picture. Actually I keep prying into the kitchens of just anybody to see how they cook. Even now I keep asking my maids how do they cook a particular thing and if they include a particular healthy ingredient or use a healthy oil peculiar to their area. What milk they consume and what kind of spices they use and all such small concerns that I have. I spotted this recipe when the family of Muslim laborers from Bihar were living in the half constructed parts of our home when it was under construction in 1987-88. They would have a bath after the day's hard work, go to the market to bring vegetables and cook their food on leftover wood scrap from making the doors etc. Their meals used to be like a feast even if they had frugal resources. They would cook daal, subzi, raita and chutney everything with the rice and thick hand patted rotis. They were the happiest when they cooked and always ate their food with happy sounds of laughter. Sometimes they would cook for all of us and their moti roti, mutton curry, kale chane ki ghugni and Baingan ka tarua became our favourite too. I remember how just two of those moti rotis were enough for the whole family of us 5 siblings and parents. Nobody could eat more than a quarter of that humongous smoky moti roti. I still make that roti with baingan ka chokha and a thick peeli daal but it lacks the smoky flavor of fire wood. It is a simple fry made with the round large variety of brinjals. 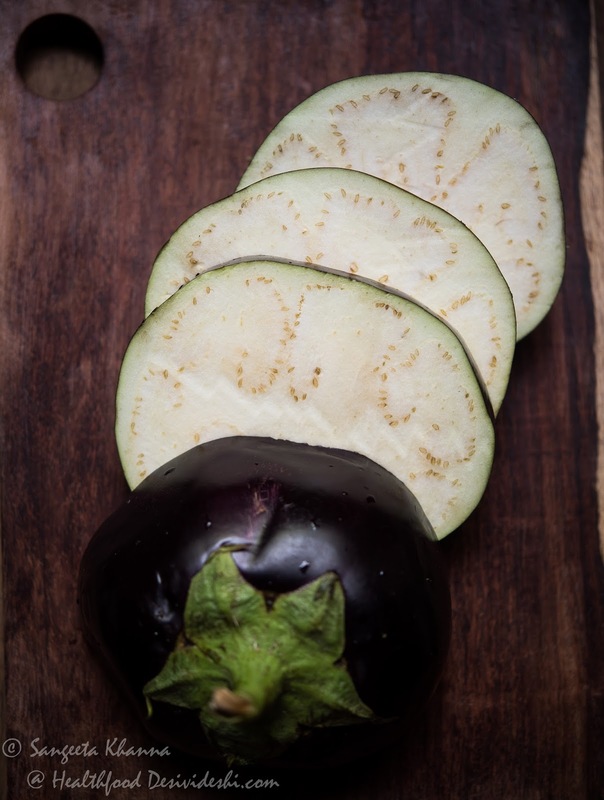 Large brinjals are used because their pulp is softer and more flavorful for such a fry. Also because they make larger slices. To choose the best round brinjals, look for light weight shiny skinned large brinjals. Light weight brinjals never have mature seeds and get buttery when cooked. Make a paste of all the ingredients except the brinjal and oil. Slice the brinjal into 1.5 - 2 cm thick roundels. 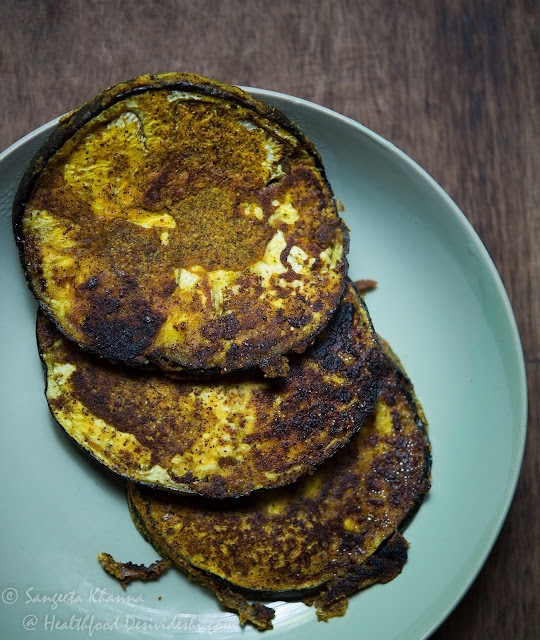 Heat a skillet or flat base kadhai with a little mustard oil. 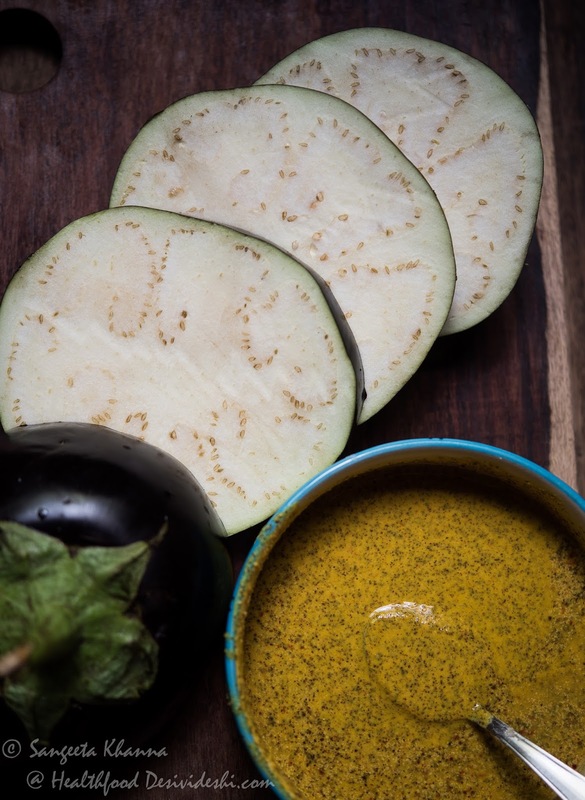 Dip the brinjal slices into the paste and shallow fry them both sides till brown and crisp on the surface. Keeping the flame low helps. The slices will remain mushy inside. The rice in the masala paste makes it crisp on the surface while it remains mushy inside, a very interesting texture when served hot. A hot , tangy and slightly tingling taste of mustard makes it a very interesting dish, you will see it disappearing from the platter very fast, even baingan haters would take second helpings (if they are not allergic to brinjals and mustard oil like two of my extended family members) and you'd see yourself smiling. They are great for kathi rolls and I do that very often with the leftovers, although leftovers is a rare incident with these. With very thin slices of onion it tastes yummy inside an instant kathi roll. Sounds delicious; I have seen some Oriya dishes: raw plantain, yams made like this. Woww fabulous looking baingan fry, looks absolutely tempting and new for me..
droolworthy and mouth watering recipe. Mouthwatering, just imagining the taste of mustard with soft brinjal, feel like having it now itself :). wow, very new recipe and looks so tempting. wow sangeeta..that sounds really delicious and yummy. Hi Sangeeta, I liked the recipe and also the way in which you have described the whole labourers and their cooking.. and yest anything to do with mustard.. its yum. I liked the mustard sauce of Nirulas in Delhi so much.. will try this soon. i like the way u described the labourers cooking.. true rustic cooking always taste great. In our place, they say that fish gravy cooked over earthern gravy taste great,. the eathern ware adds taste to it. Sangeeta, is that raw rice or cooked rice that you used? I would love to try this at home! GB...it's raw white rice used here. It has to be ground along the other ingredients , otherwise you can use rice powder if you have that. I never tried bringal with such bater!Must try! Hi Sangeeta, I can relate so much to u, as a child and today too, I can just stand and ask anyone about their recipes and the rustic verions are always the best. 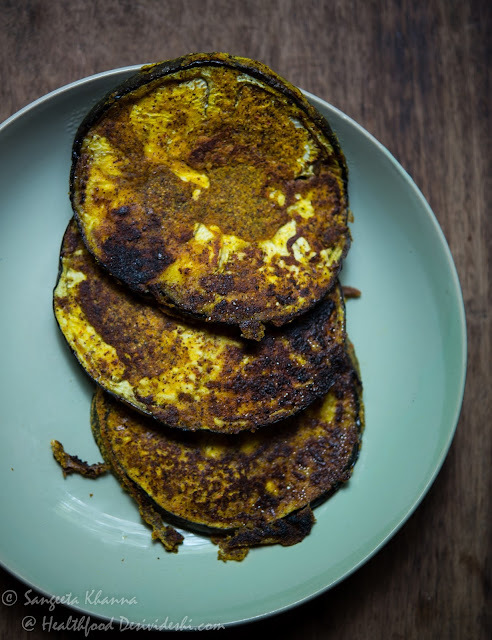 I love the moti roti and this Brinjal preparation I am trying sooooon. Thanks for sharing, can smell the mustard..
Sangeeta, Thanks for the tip. I have rice flour at home--I don't use it too much, so it lasts ages! This is another dish to add it in! Thanks again! I love baigan too..Gotta try this recipe soon! This is absolutely new dish for me...must try immediately. Like ur post very much...i luv eggplant n will try it sometime...it reminds me the way my FIL makes fish cutlets with rice flour n spices. Baingan fry looks spicy, yummy and tempting. Never heard of this kind of dish before...looks simply mouthwatering...Bookmarked it!! Do you soak the rice before grinding, or use cooked rice, or will rice flour do? And while I am at it, every time I am online for a recipe or just help (that feature about how to choose a lauki - priceless! ), I send up a little prayer that your blog never goes off the net! Last remark gobbled up by the net goblins. Ah well. Just thanking God for you, and the net. Do you soak the rice or use cooked rice or what? I was thinking of trying with rice flour. Wonder if it'll work? Thanks for the lil prayer girl :-) I am glad you find my blog useful. The rice has to be soaked just for the time you do other preps for the dish, chopping n washing etc., just grind everything together in your trusted mixie or grinder and it should be fine. Rice flour will be good too, but if you are already making a paste of mustard, it helps to add a couple tsp of rice to the same mix. It grinds fine even if it is not soaked.